A brief history:- Formed in 1980, split in 1986 and then reformed again around 2009. For the full Biography check the bands website or Wikipedia. “Sound Of Silence” is, for those who don’t know a cover of a Simon and Garfunkel song written in 1964 and included on the album “Wednesday Morning 3am” The original sounds like a day-dream. Apparently it was written in the bathroom with the lights out, a stream of consciousness conjured by the sound of running water. It is however a light and breezy ode to non communication written in isolation! 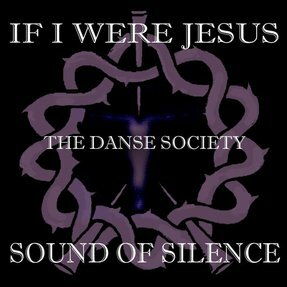 The Danse Society mix is smokey, a bit like you are sitting in a dark smokey wood in the dead of night and hearing the sounds snake and ripple through the trees whilst you sit on a mound of damp moss, elbows on knees staring blankly into the distance with moist eyes and kohl trails streaking their way down to the corners of your mouth, the perfect soundtrack to a preoccupied mind delving the depths for answers to questions that you did not know you were asking!! I think the vocals in this version could be a bit further forward in the mix but other than that its a great rendition. I think there’s an E Bow in there too, is that an E Bow? I’ve heard the Sharleen Spiteri version (The Movie Songbook)which i found a bit naked and the Bananarama version (Viva) was girly but with simple funky bass. To sum up i’d say this is an good Double A side, it won’t be everyones cup of tea and to others it’ll be an acquired taste!